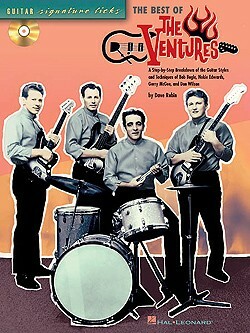 The Ventures and The Shadows started out on their recording careers at around the same time. Their paths have never converged, but on a number of occasions they have recorded the same material, without entering into direct competition. 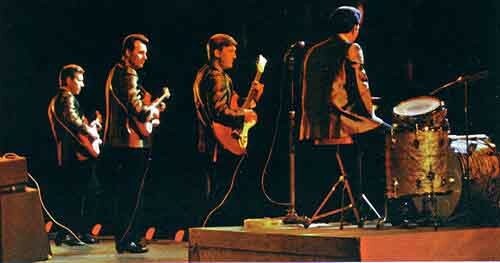 Although they featured the number with a Ventures-style arrangement on radio, The Shadows refrained from fielding a ‘Walk, Don’t Run’ of their own in 1960, a version eventually appearing in 1977. 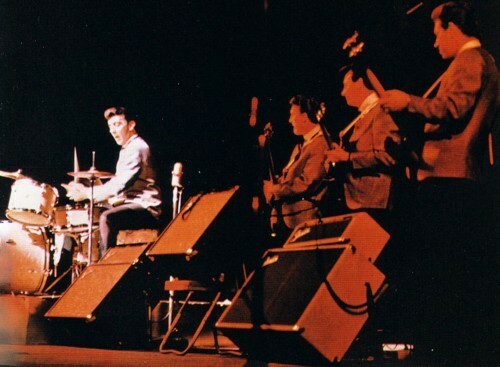 They wisely made no attempt either to rival the dazzling tour de force ‘Perfidia’, though they played it on BBC radio in June 1961 essentially in Ventures mode but with a distinctive Shadows ‘imprint’ (rather less breathlessly, with a richer, fuller-bodied sound and some showy improvising touches from Hank towards the close). In the recording studio they chose to work it up into a more laid-back, some might say quaint, cha-cha styling, on their second album which was released in October 1962. 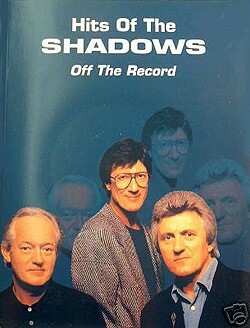 However, the names of Bogle, Wilson and the rest have never featured in composer credits for Shadows recordings. The Ventures on the other hand have nodded in the direction of The Shadows from time to time, though not in a very high profile way, whether recording tunes strongly associated with them (‘Man of Mystery’, ‘The Savage’, ‘Peace Pipe’, ‘Wonderful Land’, ‘Dance On!’; for their ‘Apache’ they looked elsewhere) or, in a solitary instance, penned by them (‘The Rise And Fall Of Flingel Bunt’); in addition, it would seem that certain elements in BLUE STAR owed something to The Shadows’ arrangement. The aim of this feature is to move beyond these obvious correspondences by identifying all shared compositions spanning the years 1960-2006, considering the way in which each of them is approached, noting points of similarity and contrast. No attempt has been made to deal exhaustively with every last version of the numbers reviewed. The Ventures in particular, and individual members for that matter, have returned, often more than once and in some cases repeatedly, to the selfsame piece, with an abundance of live recordings, primarily from Japan, swelling the total. 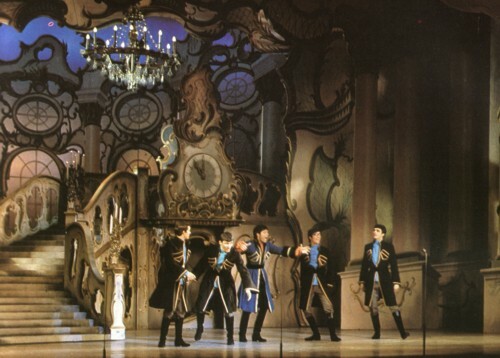 As noted below, there are in fact some sparkling onstage performances from the group that merit attention; but the line has been drawn at poring over successive airings of ‘Walk, Don’t Run’, ‘Apache’, ‘Perfidia’, ‘Telstar’ or ‘Slaughter On 10th Avenue’, each of which would probably throw up enough material to occupy a lengthy essay. This revisiting process, and the sheer profusion of material issued by The Ventures over the 1960s in particular, are sometimes seized upon by members of The Shadows community as a means of disparaging the group popularly reckoned to be their American counterparts. The Ventures though are, and always have been, a potent force in the world of instrumental music, trend-setters in fact, and they simply cannot be dismissed in such a facile manner. 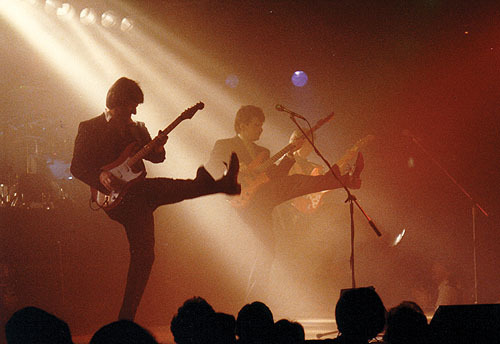 Whereas Shadows fans these days must resign themselves to a diet of constantly repackaged past glories, with material in similar mould emerging at intervals from Hank Marvin, The Ventures have kept going (in various combinations, but with ace lead guitarists Gerry McGee and Nokie Edwards both still contributing, while simultaneously pursuing solo paths), right through to the 90s and on to the present day, frequently indeed reworking their classics but also recording a wealth of fresh material along the way, much of it of an admirably high standard. As for 60s output specifically, the totals for recorded tracks issued from 1960 through to 1969 certainly leave The Shadows trailing way behind. According to my own Discographies, the tally is Shadows 201 (+ 18 live) ~ Ventures 423 (+ 72 live). [see now Driving Guitars p.6 for a revised, higher total.] Still, high productivity in music-making is not automatically a recipe for indifferent quality, often quite the reverse. Admittedly The Ventures’ substantial catalogue has its decidedly unimpressive moments. Yet that applies to The Shadows too with their significantly slighter output. All this said, it is worth looking more closely at the the disparity between the respective yields of the two groups, since bare figures leave some aspects unexplored. 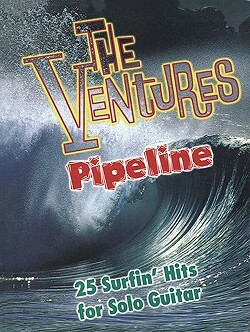 For one thing, not only did The Ventures quickly prove themselves consummate musicians with extremely proficient lead guitarists at the helm, but they spread the load by enlisting other accomplished players on their recordings on an ad hoc basis: see the run-down by Dave Burke, ‘The Studio Ventures’, Pipeline 44  9ff. (and also id. 60  6: but the extent of the help “bought in” by The Shadows needs to be more closely defined). 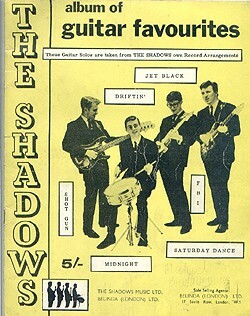 For another, The Shadows' output was by no means steady or uniformly distributed over the entire decade, since in 1960 they were still finding their feet and issued a mere handful of tracks in their own name, while both 1968 and 1969 were unsettled years for the group and consequently pretty sterile as far as new studio recordings were concerned. 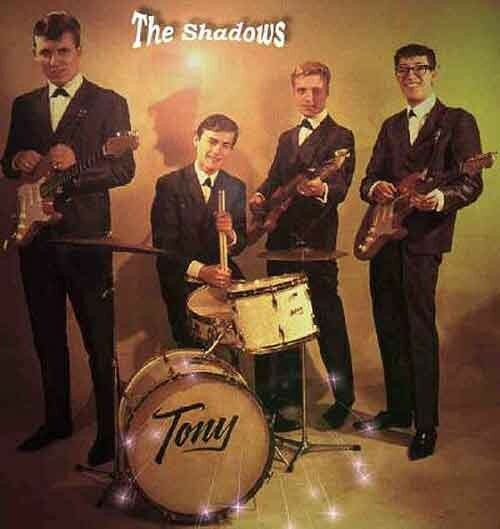 It is worth noting that 1967 was an exceptionally productive year for The Shadows, their output boosted significantly by the decision to record Japanese-related material designed for a market into which a certain other guitar group had made and were making such spectacular inroads. Finally here, and most importantly: whereas the individual Ventures certainly pursued other interests during this decade, their activities were, in comparison with those of The Shadows at any rate, narrowly focused. The latter, with notable success, expended an enormous amount of time and effort, both individually and in various combinations, on writing song upon song for Cliff Richard, and performing extensively on record with him (as ‘Cliff Richard & The Shadows’ on over 150 numbers), as well as on stage and screen (both big and small): at times in the first half of the sixties they seemed positively inseparable. Group members as well as singer were also encouraged to develop skills associated with that quintessentially British proccupation of the time (well into The Beatles' era and beyond it for that matter), the grooming of pop stars as wholesome, well-spoken all-round family entertainers – an aspect of their armoury that spilled over into The Shadows’ onstage personae. Throughout their concert career they have been concerned to ply their audiences with oft-repeated witticisms, quips and banter, not to mention liberal displays of nimble footwork and even robotic manoevres. From The Ventures’ side interludes between numbers more often than not provoked (certainly in the 60s, and well beyond that from what I have seen) an unceremonious and deadpan statement of intent, in barely credible contrast to the astonishing fire and energy injected into the music itself: "Here’s one called …" One of my favourite images of The Ventures is that captured on video and now DVD of a 1984 spot in Oklahoma. George Geddes remarked wryly of it: “… guest bass man Paul Warren … is the most mobile on stage” (Pipeline 63  52). In fact, clearly transported by the music, Warren bobs up and down constantly, so much so that the contrast with the stock-still Nokie Edwards, his expression or lack of it largely shadowed by an enormous hat, verges on the comic. These radically diverse approaches to stagecraft are in accord with the broader picture of the American group getting on with the job of making records far more single-mindedly than their UK counterparts, with their very different backgrounds and notions about what constitutes entertainment. It is simply not possible to imagine The Ventures of all groups in the 60s performing folk songs for the ears of a predominantly middle-aged and elderly audience in a theatre looking like a throwback to the days of the Victorian music halls, with acoustics to match; or capering about in tights and other unlikely looking garb in a daft feature film; or, still less, devoting themselves to lengthy spells in pantomime in one of which shiny guitars, amps and drums were carried onstage on a donkey cart – antics extending beyond music-making pure and simple into the sphere of "the English love of pretending, dressing-up and being silly – a basic frivolity that [accounts] for aspects of English pop music which baffle the more sensible American mind" (Ian MacDonald, Revolution In The Head: The Beatles’ Records And The Sixties, updated 1998 edition: p. xv). A choice example of gifted musicians being encouraged to fool around with embarrassing ineptitude in period costume is the 1964 spoof of A Midsummer Night’s Dream, in the 60-minute TV special Around The Beatles: it is accessible on YouTube at the time of writing. Entries are arranged chronologically taking as a starting-point the earliest example of a given title, from The Ventures or The Shadows as the case may be. Release dates relate to the UK for Shadows, to the US for Ventures, unless stated otherwise. All initial recordings are considered, with subsequent versions of titles also noted where it seems instructive to do so. (i) Re-Recordings The Shadows put out new versions of their major hits in 1989 as a one-off, on the album The Shadows At Their Very Best, generally held in little or no regard, and forming no part of the present survey. Similarly, the so-called Tridex material from The Ventures of the late 70s/early 80s is generally dismissed out of hand, and it is certainly hard to summon up any enthusiasm: “They lack that spark, that great Ventures feel” as Alan Taylor put it (Pipeline 59  52). On the other hand, towards the end of last century and in the opening years of this, The Ventures embarked upon a second major overhaul with a systematic programme of re-recording numerous tracks. These latest renditions have attracted widespread if not universal praise and demand attention. Comments are made in the main entries where appropriate. (ii) Live material officially released With the lucrative Japanese market making constant demands, the body of live material issued in The Ventures’ name is ample by any standard. Indeed, for collectors and fans outside Japan, the succession of albums generally proved far too costly in the days of vinyl, and subsequent CD implementations of a number of them were marketed in expensive boxed sets. A pity, as there is a wealth of great music to be had: a number of the most striking live versions need to be mentioned in this survey to provide a more balanced picture. Fronted by guitarists of the dexterity and inventiveness of Gerry McGee and Nokie Edwards, The Ventures were capable of producing a wealth of novel touches and, though less commonly, wholly fresh approaches. The situation is radically different with The Shadows, for whom live recordings are in comparison relatively scarce, on legitimately marketed product at any rate. On the whole they stuck much more rigidly to the versions familiar from their records, to the extent that there was mutual interaction between audience and performers virtually amounting to a pact (a pact that backfired spectacularly in the Marvin, Welch & Farrar debacle): the audience expected little or no divergence from the templates established in standard studio recordings and the group took great pains to adhere to them. On this aspect of their performances (at times less pronounced, it is true, particularly during John Farrar’s relatively short association with The Shadows) there is a detailed and revealing, if somewhat overstated, exposé from Bruce Welch in Pipeline 69  10ff. 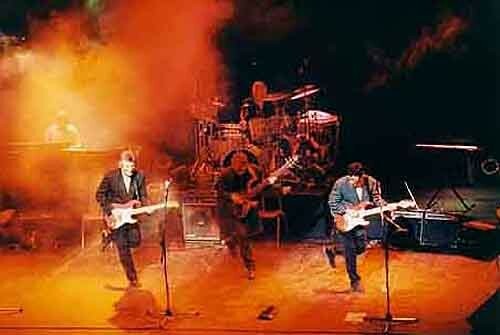 Consequently, as far as the items considered in the present survey go at any rate, little or nothing can usefully be said about The Shadows’ live recordings. (iii) Unreleased material/ unsanctioned releases The Shadows included in their stage act and other appearances many pieces, chiefly vocal, which were never officially released; they are set out systematically in A Pocket Guide To Shadow Music pp.388ff. Specimens of just about all of these Shadows’ numbers (a little over fifty) have been preserved, for the most part rescued from oblivion on ropey recording equipment and subsequently marketed illicitly, on cassette tape (occasionally on vinyl too) and latterly on CD-R. Material of this nature however is not in general circulation and so is excluded from the present review. 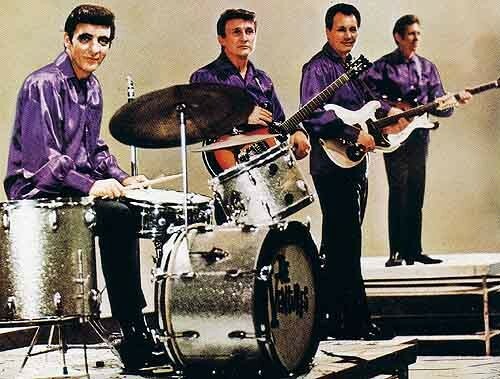 That includes releases claiming legitimacy, for example, ‘Never On Sunday’, a number studio-recorded by The Ventures: a Shadows version surfaced on an Italian CD marketed as sanctioned product on the basis of self-formulated rules from an outfit subsequently closed down unceremoniously. Nowadays this and related collections are certainly marketed, but only ‘unofficially’ – the fashionable cosy euphemism for ‘illegally’. The proportion of Ventures material of this nature, Dave Peckett tells me, is very small relative to their exceptionally high output on record: is a comprehensive list with dates, venues etc. to be found anywhere? My thanks for advice and help of various kinds to Dave Burke, Tony Hoffman, Dave Peckett, Alan Taylor, Gerry Woodage and Les Woosey. Naturally I bear sole responsibility for the views expressed on the individual releases.